What a great looking bakelite camera. But that's not all. Not only is the Purma Special stylish, it possesses one of the wackiest shutter designs to be found in any camera. The Purma Special was introduced in 1937 and sold until ca 1951. 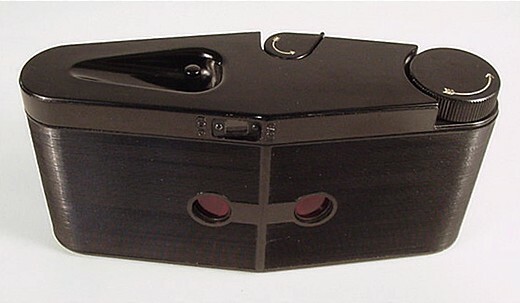 It was sold by R. F. Hunter of London, England, and manufactured by Purma Cameras Ltd, also of London, England. According to British Camera Makers by Norman Channing and Mike Dunn, © 1995, published March 1996 by Parkland Designs, Purma Cameras Ltd. may not have actually manufactured cameras. Manufacturing may have been sub-contracted. But Purma Cameras Ltd. owned the patent rights to this unusual design. 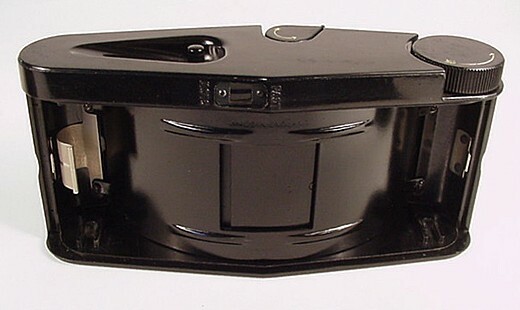 This image shows the Purma Special lens cap attached to the camera. The lens is spring-loaded. When the lens cap is attached, it presses the lens mount into the camera body. Also, when the lens cap is mounted, the shutter release is locked. This is a good way of preventing the photographer from snapping an exposure with the lens cap left on. This is a simple camera to operate. The wind knob can be seen on the left. On the camera front, above and left of the lens is a lever that is flipped to arm the shutter. And the shutter release can be seen protruding from that comet shaped well on the camera's right top. There is a simple but clear eye-level optical viewfinder. The lens is a fixed aperture f 6.3, 2 1/4 inch focal length, Beck Anastigmat. Red windows are used to count exposures. 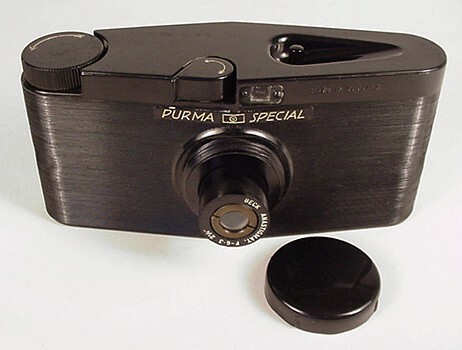 The Purma Special takes sixteen 1 1/4 inch square photographs on size 127 film. This is the reason the camera has two red windows. A camera taking eight exposures on 127 film would require only one window. For an explanation of dual-window sixteen exposure cameras, see the Falcon Model F page. 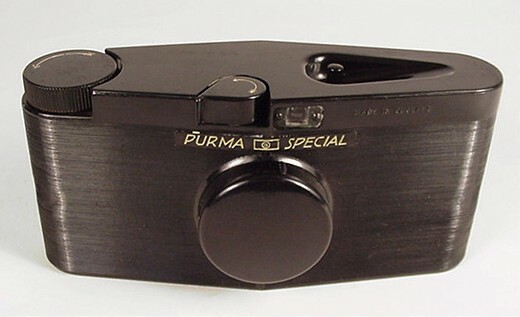 What is special, and wacky about the Purma Special design, is its focal-plane shutter mechanism. The Purma Special offers three shutter speeds. British Camera Makers gives the speeds as 1/25, 1/50 and 1/450 second, but a 1938 catalog description mentions 1/25, 1/150 and 1/450 second. Regardless of who is correct, the three speeds are known more simply as Slow, Medium and Fast. You may have noticed the camera has no shutter speed selector. So here is the zany part - and why the film format is square. Medium speed occurs when the camera is held horizontally. Fast speed is achieved by holding the camera vertically, with the wind knob up. To shoot at the slow speed, hold the camera vertically, and with the wind knob down. Simple. Based on gravity. Newton would be impressed. As a reminder to which way to hold the camera, the words Fast and Slow are molded into the bakelite surrounding the viewfinder eyepiece. If you have an interest in creative bakelite designs, you may want to look at the Tower Jr. and Photax V pages. For others, check under Bakelite on the Index/Search page.